If you’re in the market for a brand new vehicle, the 2016 Toyota Camry can’t be missed. This luxurious ride is sure to fulfill all your needs and deliver on your wants as well! The impressive features that come standard on the Camry will leave you inspired, ready to hit the road for that long trip you’ve been putting off! The available add-on features allow you to customize your vehicle so it suits your Florida lifestyle. The Camry is a viable family car option as well as a long weekend warrior, handing the road with jaw-dropping precision. Stop by our Toyota dealership today to go over all the details of the 2016 model, and to slide behind the wheel to experience this thrilling ride for yourself! Our friendly Venice team is standing by, ready to assist. Start your search now using our online inventory system to explore the many options available; shopping from home is a breeze, thanks to our user friendly website. We look forward to welcoming you and finding a Camry solution today! Purchasing this vehicle is a way to get a safe vehicle that doesn’t skip out on design. Slide behind the wheel and get the vehicle started with the Smart Key system that allows you to power your Camry up with the push of a button. No more fussing with a jangle of keys or digging through purses. The Camry blends practicality with style, so experience true comfort as you maneuver the 8-way power adjustable heated seats that provide astonishing lumbar support. Long drives never felt so good. The mounted controls on the steering wheel ensure you have everything you need right at your fingertips so you can focus on the road ahead. Change the radio station or make a phone call with the push of a button, while keeping you and your cargo safe. The wood-grain style accents will deliver you to your destination in style and leave you craving another ride. You won’t be the only one craving a ride, as you’ll start to notice all the heads that turn when you cruise by. The available sport mesh grille commands attention as you zip by on 18-inch alloy wheels while the lED headlights illuminate your way. The crowd will get one last parting glance as you turn the corner, showing off the dual chrome-tipped exhaust before you disappear onto the road. Having a standard ten airbags is almost unheard of. Not for the 2016 Camry. Your safety is important to us, that’s why the airbags are strategically placed and designed to provide maximum protection. In this way your entire body is shielded from any front end collisions, not just your head and torso. We understand that accidents do happen, and unfortunately you can’t always see it coming. Our driver’s seat helps cut down on any potential injuries, with its controlled yield design that works to minimize whiplash and neck injuries. Talk to a staff member to walk through all these features and see them for yourself! The Star Safety system comes standard on every 2016 Camry so you can rest assured you’re protection is a top priority. This system has a multitude of features that all work together to deliver a smooth and safe ride. The Vehicle Stability Control and Brake Assist work in conjunction with the Smart Stop technology, all helping to avoid any potential accidents. 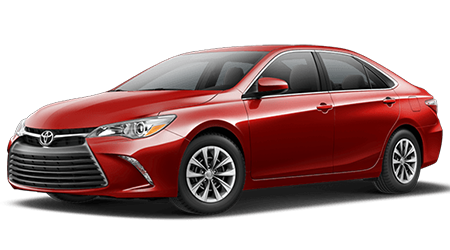 You can customize your Camry’s safety features, by opting to add on the Pre-Collision system or the Blind Spot Monitor, and be sure have a sales associate show you how the backup camera works! The Tire Pressure Monitor will alert you to any dangerously low situations while the Lane Departure Alert can help keep your vehicle where it needs to be. Safe driving is a breeze, thanks to the 2016 Camry. Pop the hood to take a peak at the 3.5-liter V6 engine that delivers 268-hp. Take those road trips with confidence, thanks to the EPA-estimated 31 mpg on the highway. The springs and shocks of the Camry have been recalibrated to provide a silky smooth ride while the Electric Power Steering ensures the vehicle responds effortlessly to your every command. The aerodynamic design of the car only adds to its efficiency, using strategically placed vortex generators that help to reduce drag. This not only cuts down on the noise level inside the cabin, but helps in your fuel economy as well. Take the Camry for a spin to get a first hand experience of these impressive features. The Multi-Information Display comes standard on the Toyota Camry, providing a wealth of resources. You can customize the screen to display the data you find most relevant, like incoming calls or fuel economy. Need directions to an unfamiliar location? No problem, the display can give you step-by-step instructions so you can focus on driving. Talk to your Camry all you want, and with the advanced Voice Recognition system you choose to add on, she’ll respond to your requests! Talk to a team member about your lifestyle and driving habits. We can suggest other helpful features that will make your life run a little easier, like the Entune App Suite or the system that delivers real time traffic updates, so you can find an alternate route to get to that meeting on time! Once you’ve gotten behind the wheel of this impressive vehicle, you’ll never want to leave. It will make you wonder how you ever survived without the 2016 Camry! Our dedicated team is standing by, ready to answer all your questions and address any concerns that may arise. We provide a no pressure atmosphere so you are free to shop at your leisure. We’ll help you gather all the information and schedule different test drives so when you drive off in your brand new Toyota, it will be with the confidence that you were presented with all the available options to make an informed decision. We thank our Venice customers for their continued support and look forward to welcoming our North Port, Port Charlotte and Punta Gorda clients. Make the short ride over today, we eagerly await your arrival!